"Peace is not the absence of conflict, but the presence of God no matter what the conflict"
1st Annual Northwest Sprint Car Invitational"
Please call 541-567-2330 and ask for the special October "Sprint Car Invitational"
Paved sprint car racing in the region runs one of its biggest events as the WESCO series invades Hermiston’s Super Oval for a two-day show beginning Saturday afternoon. Spokane’s Tony Berry is happy the season has run into late September, as he’ll be able to take part in the race after a slow start to his season. With a son born on Valentine’s Day and motor woes that have held back some of his team’s efforts to run on a consistent basis this season, Berry is eager to close out the year on a good note while cautiously looking forward to 2015. Focus on the race ahead is the mindset for Berry and his team. While not racing on a consistent basis this season, Berry’s no stranger to WESCO as a past champion (2012). It’s a challenging series with plenty of history. Having cut his teeth on the now-defunct Inland Northwest Sprint Car Association circuit, Berry would like to see local tracks add more sprint car racing to their schedules. 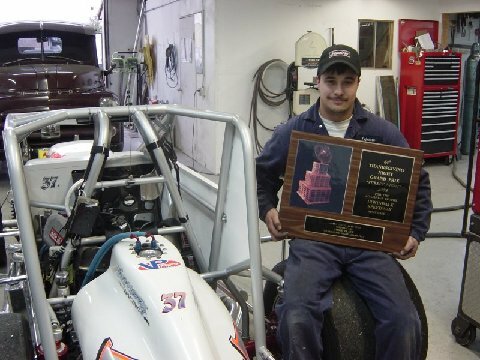 Berry has been successful in late models, karts and other forms of motorsports in addition to his sprint car championships. Having that versatility to draw from keeps his competitive juices flowing when he’s behind the wheel of a 600-horsepower car that is a handful to drive. Posting strong results in his career at the quarter-mile Oregon track, Berry still has work to do once he unloads for practice at Hermiston. 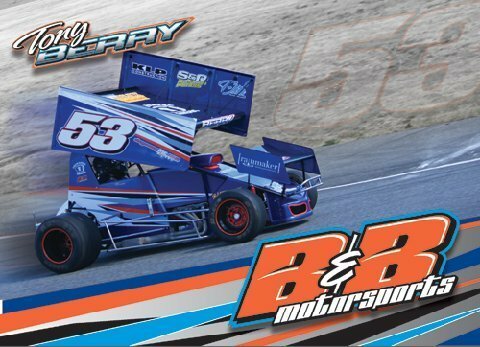 April 30, 2014 (Spokane, WA) – The B&B Motorsports team, with driver Tony Berry, is ready to kick off the 2014 racing season this Saturday night at Ephrata Raceway Park in Ephrata, WA. The non-wing event at the tricky quarter mile oval is the season opening event for the Pepsi Racing 360 Sprints. The #53 entry will have a new power plant for 2014 courtesy of Stipe Engine Specialties of Redmond, OR, which will also feature hi temp coated headers from new marketing partner, Liquid Transformations. “We are proud to represent these two businesses and we hope that the results are as fast as they are beautiful,” stated team co-owner Mike Bartle. The 2012 WESCO Championship team intends to run a limited schedule for 2014, with the next event coming as the season opening race for the WESCO Sprint Car Series at the Hermiston Super Oval in Hermiston, OR May 17th. “We would love to run some additional events this year, but as of now it’s looking like four or five races so we’re going to make the most of each opportunity. The Witte’s have always had a tremendous commitment to open wheel racing and we’re very excited to get the season started this weekend at Ephrata,” commented Berry. 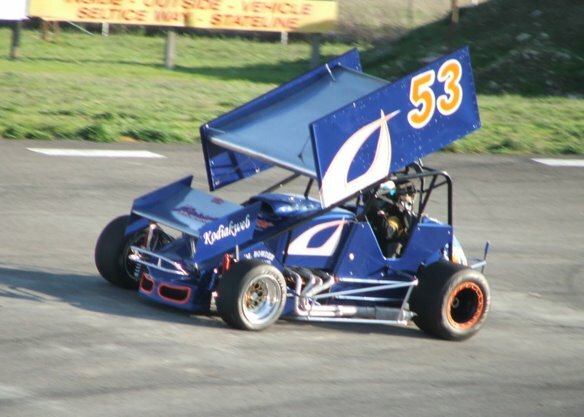 Come out and cheer on the 53 car at Ephrata Raceway Park this Saturday, May 3rd. Gates open at 5 pm with racing at 7 pm. 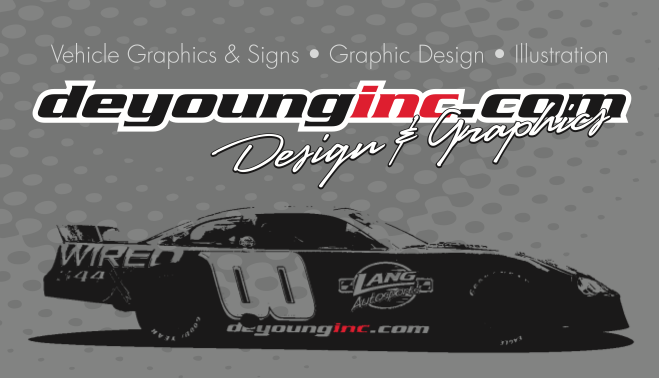 For more information on the B&B team visit: www.facebook.com/BandBMotorsports or call 800.336.2682. June 25, 2013 (Spokane, WA) – Reigning WESCO Champion Tony Berry and the B&B Motorsports team will kick off their 2013 season this Saturday, June 29th at the quarter mile Stateline Speedway in Post Falls, ID. The rest of the 2013 season is still up in the air for the B&B Motorsports team, but tentatively on the schedule are WESCO events at the Wenatchee Valley Super Oval on August 10th, the Spokane County Super Oval on August 17th, at Evergreen Speedway on September 7th and the Hermiston Super Oval on September 14th. “We’re looking for additional marketing partners and with success, we’d be able to add races to our schedule,” stated Berry. Come out this Saturday, June 29th and cheer on the #53 team. Qualifying begins at 6 pm with racing at 7:15. For more information on the B&B Motorsports team please contact 800.336.2682 or visit us on facebook at www.facebook.com/BandBMotorsports. The B&B Motor Sports team is more than READY! 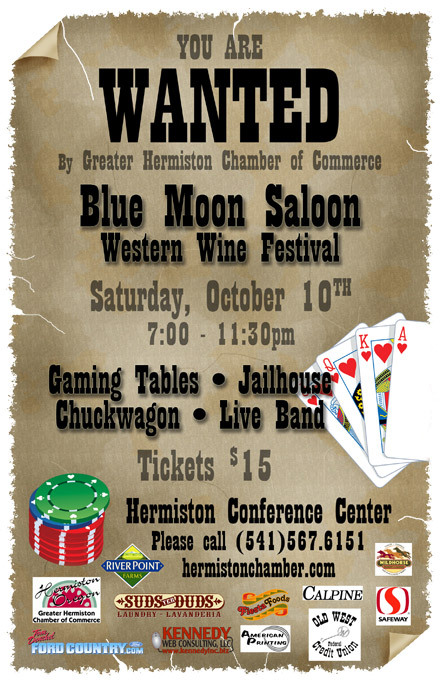 Need a few great sponsors to join with us for mutual benefit...and smile's. This experienced fun race team knows how to make 'noise' and create excitement for your company .. on and off the race track. Schedule includes a few local sprint car races and if funding allows perhaps a few Super Late Model events as well. April 24, 2013 (East Wenatchee, WA) – The 2013 WESCO Sprint Car Series kicks off Saturday night, April 27th at the lightning quick Wenatchee Valley Super Oval (WVSO) in East Wenatchee, WA. Last season, each of the seven events was captured by a different driver and the WESCO series is the only sprint car group in the North West that has races with and without the big top wing – providing a change, and a challenge to the competitors. The 2013 season championship is up for grabs with defending series champion Tony Berry only committed to a partial schedule. The two leading front runners happen to come out of the same McLees Racing stable; five-time WESCO Champion, Doug McLees and 2012 Rookie of the Year and points runner up, Danny Mathews. Returning to the track full time in 2013 is the Hill Racing team, with lead driver, and multi-time sprint car champion, Dave Hill. The colorful 05 car is always a fan favorite and will likely challenge for wins throughout the season. Also scheduled to compete are 2012 main event winners, Mike Fought, Rich Fast and Jeff Bird, 2010 INSCA Sprint Car Champion, Justin Popple, Tom Beierman, Donnie Kudrna, Mitch Holt and many more. The 2013 season will take the teams to three Northwestern states with races at WVSO, Spokane County Raceway in Airway Heights, WA, South Sound Speedway in Rochester, Washington, the Hermiston Super Oval in Hermiston, OR, Evergreen Speedway in Monroe, WA and the season championship will take place as a double header at the Meridian Speedway, in Meridian, ID. For more information on the WESCO Sprint Car Series please visit www.wescosprints.com or contact Brian McLees at 360-943-5099. The B&B team was as prepared as we could’ve hoped for this event, which in our estimation saw the biggest crowd at Stateline Speedway in a decade. The tires that we practiced on were used up – by design. We spent practice trying to make the car work well on older tires and then made a decision to try something different than we normally do in qualifying. It didn’t quite work out as we had hoped and we didn’t pick up the time that we anticipated, but still qualified a solid third and were well positioned for the rest of the night. We started outside of the front row for the A-Trophy Dash and won, on the same 120+ lap old tires that we had practiced on. Given what we had in our arsenal, we were awfully confident heading into the rest of the evening; however, Mother Nature had a different plan. Despite the track’s best efforts, the event was called due to rain before we ran our heat races. There is not yet a scheduled make up date for this event and the next race at Stateline is scheduled to be September 8th as a non-wing event; which I feel would deprive the fans of some of the speed that they were clearly yearning for this past Saturday. Kily Fleming, our resident IT guy, has uploaded many photos and videos that he took throughout the day, as well as some by Michael Baker from Kodiakweb. My guys did a great job, we were right where we wanted to be, just one of those bummers about an outdoor sport! See you guys in Wenatchee on July 14th! 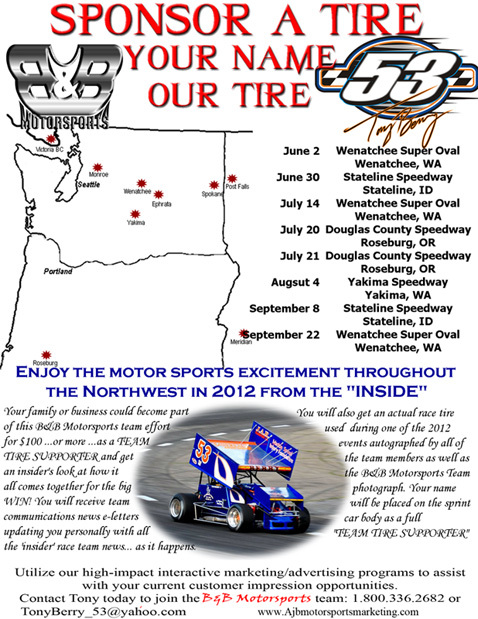 June 27, 2012 (Spokane, WA) – The B&B Motorsports team with driver Tony Berry will be making the first of their two stops for the 2012 racing season at their home track, Stateline Speedway in Post Falls, ID Saturday, June 30th. Hot off the heels of a strong second place finish in the season opening event - which saw only the top three cars on the lead lap – Berry and team look to keep up the momentum in the Whitey’s Wrecking, Fresh Baked Threads sprinter. “Prior to the event at the Wenatchee Valley Super Oval we weren’t able to get any track time at all and overcame all of the new car blues on the day of the race. My crew worked so hard like they always do and by the time the main event came we were strong, just a little too tight to make a move for the win,” commented the driver of the 53 car. Now, heading into the event at Stateline , Berry remarked, “We were able to really shake the car down recently and to be honest; it feels like the season is just starting for us. We’re prepared to protect our home turf this weekend.” The last season that the B&B team ran in 2009, the Ed Nereaux Racing Engines machine swept both events at Stateline with the Inland Northwest Sprint Car Association. 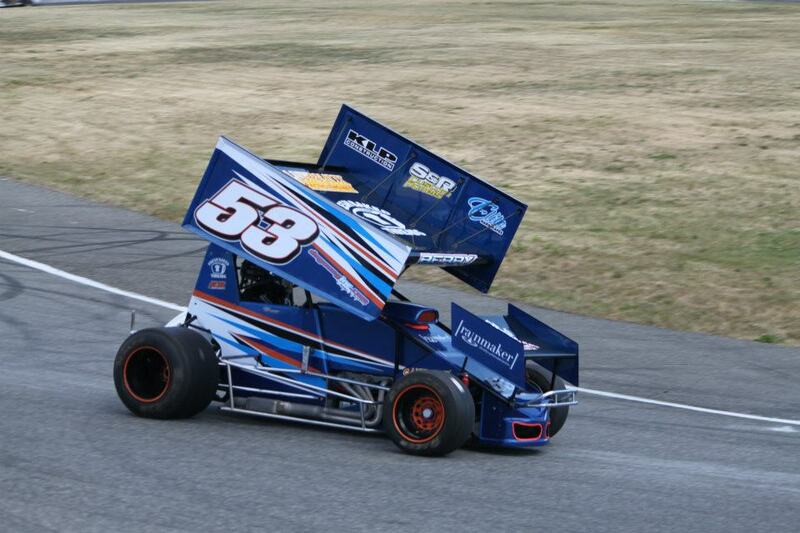 Come out and cheer on the B&B Motorsports #53 on Saturday night. Qualifying begins at 6 pm with racing at 7 pm. May 31, 2012 (Spokane, WA) – After sitting on the sidelines for two long years, the B&B Motorsports team with driver Tony Berry will be returning to the track full time in 2012 to campaign with the WESCO Series; the top traveling cast iron pavement sprint car organization in the Northwest. 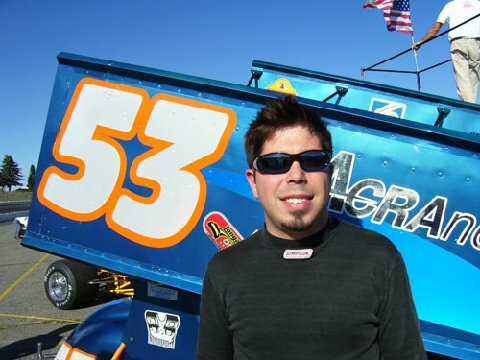 In 2009, the last year that the team ran, the #53 car won three events, finished second in points after having missed an event due to Berry marrying his long-time girlfriend, Leah, and wrapped up the season with a second place finish in the inaugural Northwest Sprint Car Invitational. "Ideally the WESCO series this year will look an awful lot like the 2009 Northwest Sprint Car Invitational with 20 plus cars in the pits from all corners of the Northwest, bringing out some of the top talent to put on a great show for the fans at each of the four tracks we will visit this year,” said Berry. 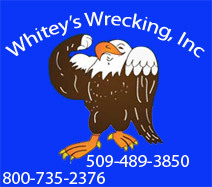 The 2012 WESCO schedule will carry the KLP Construction, S&R Custom Panels, Elite Hardscapes, Country Place Bar and Grill, Whitey’s Wrecking hauler to three events at the Wenatchee Valley Super Oval in East Wenatchee, WA, two events at Stateline Speedway in Post Falls, ID and one event each at Yakima Speedway in Yakima, WA and Douglas County Speedway in Roseburg, OR. Follow the #53 along on race day at www.facebook.com/BandBMotorsports. June 22, 2012 (Post Falls, ID) – The WESCO Cast Iron Sprint Car Series will make its second stop of the 2012 season at Stateline Speedway in Post Falls, Idaho on Saturday June 30th. The Mclees Automotive 35 will pay $1000 to the winner, a guaranteed $300 to start the race and include additional incentives not regularly offered. Among the expected participants are the top three finishers of the season opening event; winner Doug Mclees in the Mclees Automotive sprinter, second Tony Berry in the B&B Motorsports entry and Justin Popple who ran competitor Butch Duren’s car at the first event, but will look to resume the driving duties behind the J&G Machine #19. For Berry and Popple, this trip to Stateline marks one of only two events at their home track as they both hale from Spokane , WA . The opening event at the Wenatchee Valley Super Oval saw an extremely competitive group of nine take to the track which ran caution free in the main event. Perhaps the biggest surprise of the evening was Rookie James Daniel Mathews qualifying third and proving that the flamed number 11 will be a force to be reckoned with in 2012. Come on out to the Stateline Speedway, Saturday July 30th to cheer on the local favorites and the hard charging travelers. Qualifying begins at 6 pm with racing at 7. For more information on the WESCO Series visit: www.WESCOsprints.com or contact Brian Mclees at 360-943-5099. For many racers the 2012 racing season is upon us. Sign up today for an opening race weekend special! It consists of one pre-race press release and one post-race press release to put your name, and more importantly your sponsors name, in lights to start the season! Looking for a way to attract marketing partners? Or to retain those that you already have? The single biggest hurdle in obtaining and retaining marketing partners is communicating an effective return on their investment (ROI). Many racers have had success in getting a company to invest in their racing season, only to fail to live up to the company's expectations as that season progressed. AJB Motorsports Marketing exists to help answer some of the above; these very real concerns that racers are faced with when sitting across the table from a decision maker at a potential marketing partner. AJB MM provides marketing services to our customers to present to potential and current marketing partners. If you've been looking for something to set you apart from your competitors both on and off the racetrack, you've come to the right place. AJB Motorsports Marketing’s mission is to provide racers, tracks and race series’ with promotional services to establish and maintain marketing partners while spreading goodwill about motorsports throughout the community at large. • Press Releases (pre- and post-race) sent to an established list of media contacts in both print and electronic media. These will also be available for your own use/distribution. 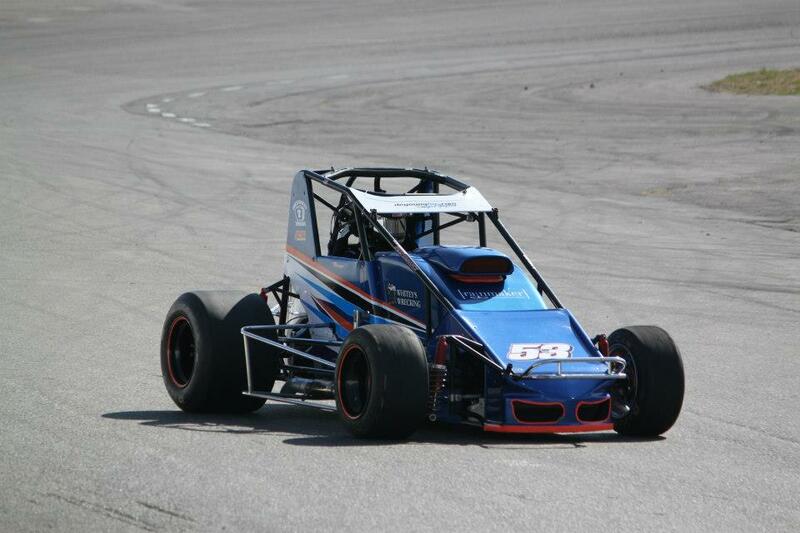 EXPERIENCED DEDICATED RACE TEAM with NEW LEJEUNE PERFORMANCE CHASSIS RESULTS IN WINNING SEASON! 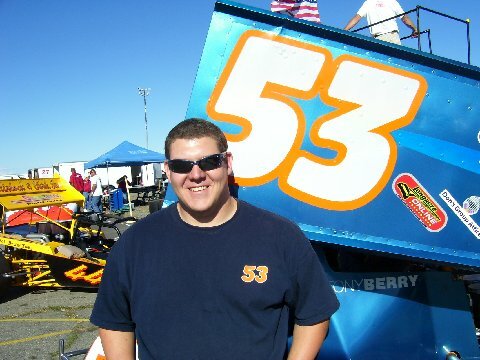 For Tony Berry and the B&B Motorsports team, the 2009 season began as an opportunity for growth and development. After procuring a new Lejeune Performance chassis, the plan for the team was to pick and choose events as the summer progressed, running locally with the Inland Northwest Sprint Car Association (INSCA) and occasionally competing with the premier ASA/NSRA traveling sprint car series. 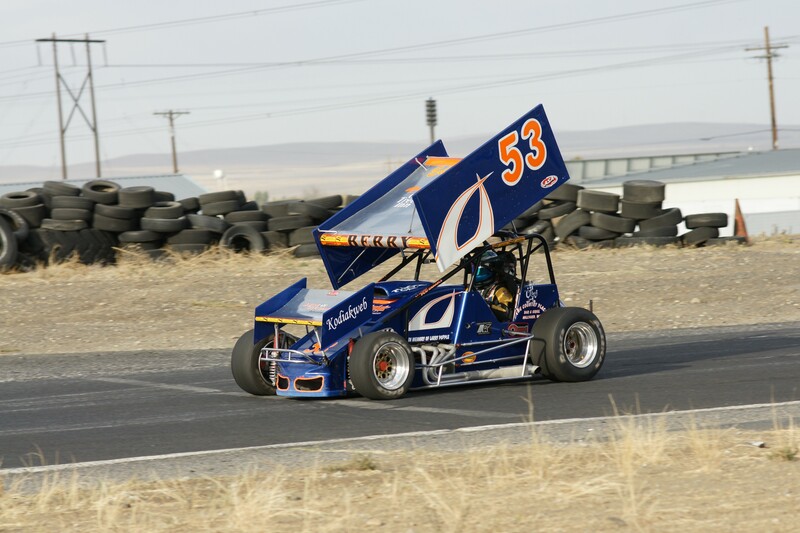 With weather dictating the early season schedule the first event that Berry and team competed in was the INSCA event at the newly re-opened Spokane County Raceway, an ultra-fast half mile oval in Airway Heights , WA . The team tested at the facility earlier in the year and was confident heading into the event. After experiencing mechanical trouble to open the day, Berry set fast time in qualifying and went on to win their first event of 2009. The second event was only seven days later at the quarter-mile Stateline Stadium and Speedway in Post Falls , Idaho . Berry again took the Country Place Bar and Grill #53 to head of the field by posting fast time once more and winning from the back of the pack due to a full field invert. “We had a phenomenal start to the season. It was really the culmination of several years working together as a team and with the addition of the Lejeune Chassis to our stable – we were very confident moving forward,” commented Berry . On June 13th, the INSCA series once again visited Spokane County Raceway and this time Berry and team were racing for a cause. A family friend, Cory Mackay, who was driving home from the Washington State University campus experienced a serious auto accident and suffered spinal cord damage in May. The Mackay family formed the Mackay Spinal Injury Foundation to offset the on-going medical costs associated with Cory’s rehabilitation. As a part of the INSCA event at SCR, Berry and his fellow drivers in the series walked through the stands in order to raise money for this worthwhile cause. When it was all said and done, the drivers and fans at Spokane County Raceway raised over $1200 that was donated to the Mackay Spinal Injury Foundation. Berry and the B&B team came home second and left the event with a commanding point’s lead and the satisfaction that comes with helping others. The team took a hiatus for the first part of July as Tony married his longtime girlfriend Leah on the Fourth of July. Going on at the same time, was race number four in the INSCA season and the B&B team would relinquish the series’ points lead. 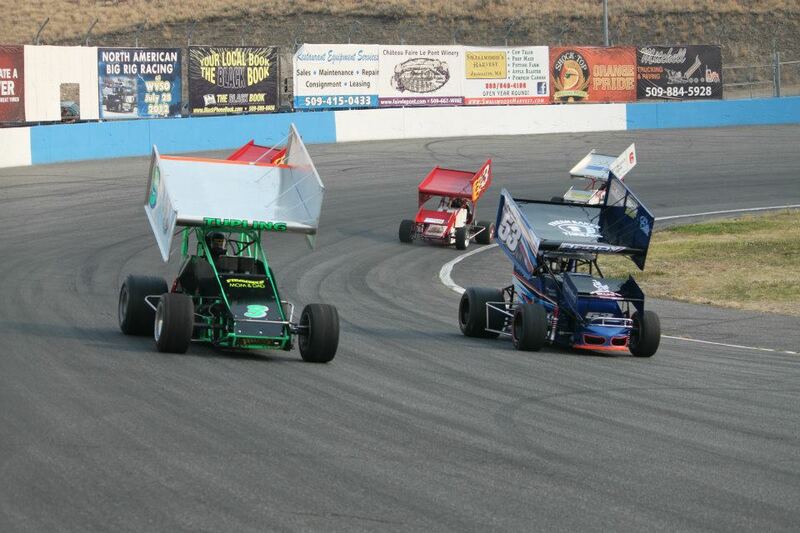 The next scheduled event for the B&B team was the NSRA race at Spokane County Raceway. With a proven set up the team was again optimistic about the opportunity to compete among the regions’ best. However in qualifying the bottom end came apart in the motor while Berry qualified ninth for the event – ending their evening prematurely. After putting in the limited motor, the B&B crew traveled to Ephrata Raceway Park for the another attempt to compete with the NSRA cars. After a promising start to the day, the #53 sprinter would start on the pole of the main event. Again, coming to take the green flag, the team experienced motor trouble, sticking a valve and limped home 18th. “Those two NSRA events were among the ones that we had circled early season as races that we really wanted to compete and run well in. It was disappointing to experience motor problems in consecutive events, but proved to ourselves that we could run with the best in the region,” said Berry of the mid-summer motor troubles. At this point in the season came the real decision making time for the team. Based on the early season successes and the recent motor set backs – the team decided that running second in points at that time with the INSCA was too big of an opportunity to pass up and would finish the year out with the series that they won the championship with in 2007. 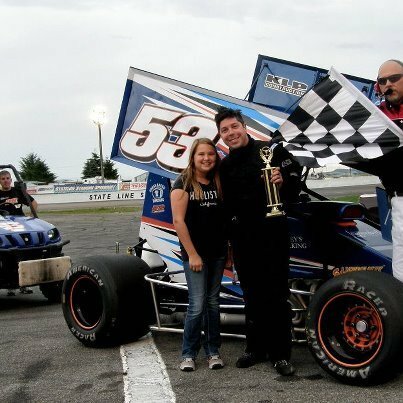 The August 8th event was held at Stateline Speedway and after experiencing power steering pump and fuel pump issues early in the day, the B&B #53 picked up their third win on the season. On Labor Day weekend the team traveled back to Ephrata Raceway Park to run the only non-wing event of the year on the schedule and the make up date for the Annual Cast Iron Nationals that were slated to be run in early May. After practicing for the non-wing portion, the rains once again came and pushed both events to be run on Sunday. Sunday began early and the #53 machine qualified 8th for the non-wing portion, but after winning the heat race was forced to start inside of row four based on the invert. After a caution plagued race in which Berry received heavy contact twice, they came home in the eighth position. The crew switched over the set up to the winged portion of the Cast Iron Nationals during a mid-day rain storm. The B&B team won the B-trophy dash and finished third in the heat, but missed the set up for the main event and ended a soggy weekend not as well as they had hoped. The following weekend the B&B team traveled to their only event in the state of Montana for 2009 at the Mission Valley Speedway in Polson. After qualifying second fastest and winning the trophy dash – the #53 car jumped out to an early main event lead in the 35 lap feature. A lap 10 red flag for fluid on the track allowed the team to determine why the car began to get tight as the car had a punctured right rear tire that was losing air quickly. The team changed the tire and restarted the race from the rear of the field. The #53 maneuvered it’s way back to the fourth position at the conclusion of the race. With one scheduled event remaining for the 2009 INSCA season, the B&B Motorsports team found itself in second place in points, within striking distance, however the Championship race was cancelled by the racetrack due to management concerns. “It was awfully disappointing to have our season cut short in that manner – while we understand the intricacies of running a racetrack it was tough to swallow. We chose to approach it like it was a rainout and decided to focus on the big end of the year show, the Northwest Sprint Car Invitational,” stated Berry . The First Annual Northwest Sprint Car Invitational was held October 10th at Columbia Motor Speedway in Hermiston , Oregon . The event was designed to bring together the cars of the regional cast iron motored groups of the Northwest to compete against each other in a non-points event. With abnormally cold temperatures the B&B Motorsports team qualified 8th, but went on to finish second in the B trophy dash and win the heat race. Berry lined up inside of row number two on the start of the main event, but after the pole sitter struggled to get going Berry got boxed in and slid back as far as sixth. Quickly dispatching with cars, the #53 moved back towards the front and got to second as the yellow flag flew for a spun car. After several attempts to get by the leader, the B&B machine came home after 50 laps, second in this First Annual event. “It was a great way to wrap up the year. We obviously would have preferred heading into the long off-season with a win, but we can’t be disappointed with the run. 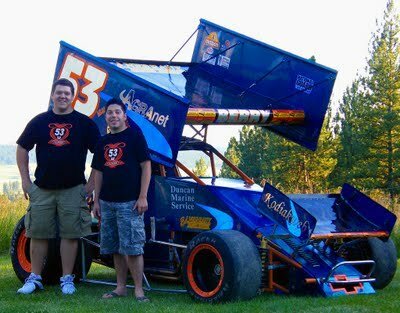 We had a tremendously strong year, with three wins, a second in points and to finish second at the Northwest Sprint Car Invitational it was a banner year and we’re hoping to take our program to the next level for the 2010 season,” stated the excited driver of the #53 car. Also a special thanks to the moms and dads, wives, fiancés, girlfriends and sisters for supporting us in our endeavors. Falling just short in his bid for a second INSCA championship to title winner, Justin Popple, 2007 series champion Tony Berry sees this weekend’s race as a chance for redemption to a strong but brief season. SPOKANE, Wash. (October 6, 2009)-For 2007 Inland Northwest Sprint Car Association champion, Tony Berry, the racing season has come down to one final event-the Northwest Sprint Car Invitational to be held Saturday, October 10 at Columbia Motor Speedway in Hermiston, Ore. Falling just short in his bid for a second INSCA championship to title winner, Justin Popple, Berry sees this weekend’s race as a chance for redemption to a strong but brief season. 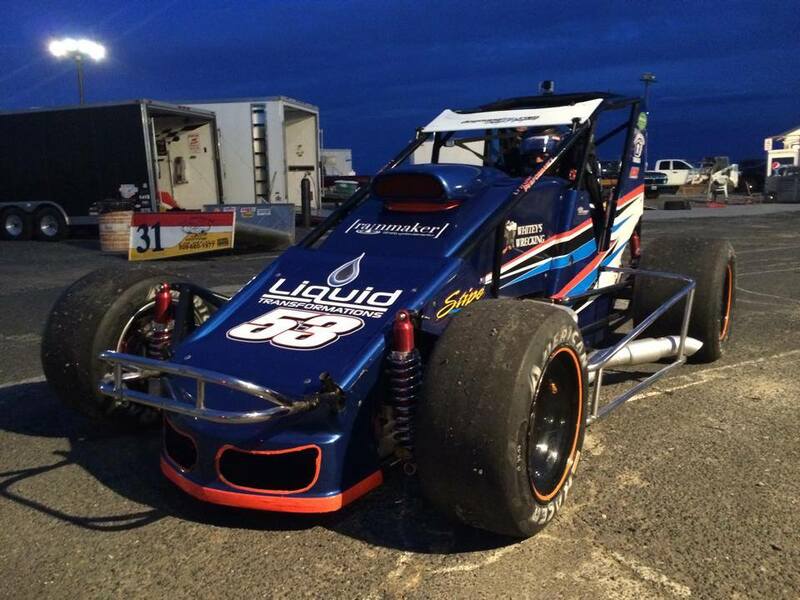 “When we began the season with our new Lejeune chassis we were focused on running strong at each event,” Berry said. “Going in there were two dates that we knew we could not attend with the INSCA group, one was my wedding over the Fourth of July and the other happened to be a rain out. When those passed we found ourselves second in points and as a racer with a committed team we went for the gold so to speak. “We changed our schedule to run the rest of the season for points and came up a bit short. We really had hoped to run the championship race at Spokane County in September (which was canceled by the race track) but we chalked that up to something like a rain out and started to focus on this Northwest Invitational here at the end of the season. Having the opportunity to jump behind the wheel of the Oak Tree Inn/Pheasant Café and Lounge No. 53 one more time in ’09 is a reward for the team’s hard work, Berry added. Berry has made laps in Hermiston and knows that the little bit of knowledge he may have could be key to besting the likes of Mike Fought, Craig Deaver, Popple and other Northwest Sprint Car stars. While working with Popple and Mark Jones to build excitement for this weekend’s event has been a daily task for Berry, the end result of a successful weekend makes the long days of working on the event coupled with working on the sprint car worthwhile, he noted. “It hasn’t been easy (balancing the needs of the race team and the event),” Berry said. Sponsors make it all happen to get a team to the track, Berry added. With the support of racing enthusiasts and regional businesses, Berry has also been able to give back to the greater Northwest community. One endeavor the Gonzaga University graduate has taken on this season is the Cory Mackay Spinal Injury Foundation, which has seen half of Berry’s winnings donated to their group after each race in 2009. Berry will use the energy focused on that project this weekend in an effort to come to the aid of fellow sprint car driver, Travis Rutz. “We’ve been able to support many causes over the years including the Cory Mackay Spinal Injury Foundation. The motorsports family is very generous in times of need and I think that has been displayed often. It sounds like a cliché but when someone in the racing world suffers a serious injury behind the wheel of a car you see time and time again this community band together to support the driver, crew and family. “Travis suffer a devastating accident at Terre Haute in a sprint car which makes this tragedy hit home hard for all racers but especially those from a similar discipline and the same region of the world. You instantly relate to what the family is going through and as you’ve seen from what is happening to help Travis, the entire racing community not just those in the Northwest, have banded together in support of the Rutz family. Berry, Popple and the backers of the idea to pass the helmet for this weekend’s event. 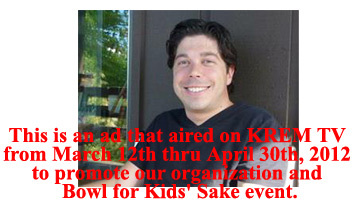 Trish and Kirk Eklund, hope to collect funds that will aid in Rutz’s recovery, he added. For more information regarding the Northwest Sprint Car Invitational at Columbia Motor Speedway log onto www.columbiamotorspeedway.com Racer information can be obtained by calling 800-336-2682. There will be a fundraiser for the bounty where SCR fans can contribute directly to this fun but worthy cause that will assist Cory Mackay. Any INSCA Sprint Car driver that can beat the B&B machine to the checkered flag will receive half of the funds with the other half of the proceeds being given to a very special cause that the B&B team has been supporting this season. 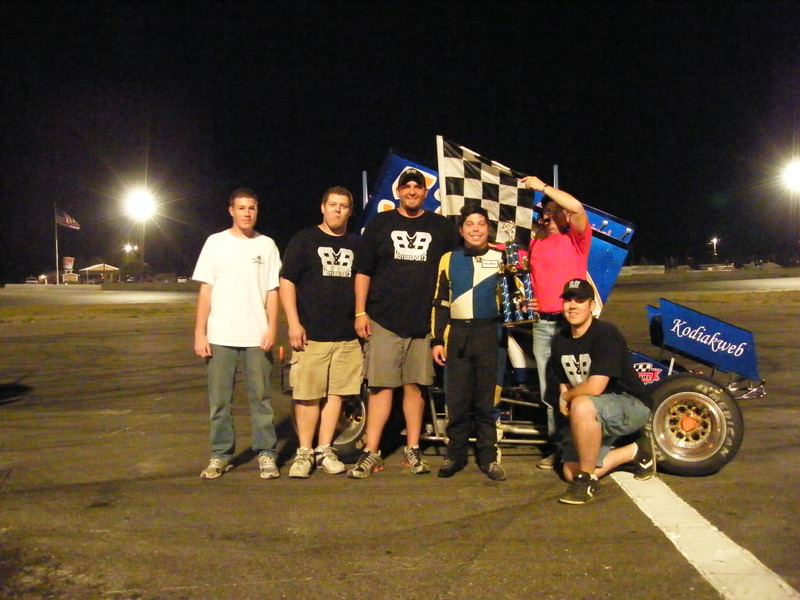 The B&B Motorsports team with driver Tony Berry has gotten off to a fast start in the INSCA Winged Sprint Car series in 2009 winning the season’s first two events. Spokane County Raceway has placed a bounty on the driver of the #53 car for the June 13th event. There will be a fundraiser for this bounty where fans can contribute directly to this fun but worthy cause. Any INSCA Sprint Car driver that can beat the B&B machine to the checkered flag will receive half of the funds with the other half of the proceeds being given to a very special cause that the B&B team has been supporting this season. A freshman football player at Washington State University, Cory Mackay, was on his way home to Redmond, WA from Pullman May 7th. While in transit, Mackay was involved in a single car accident near Washtucna after falling asleep just after 5 pm. Mackay was air lifted to Harborview Medical Center in Seattle, WA where it was determined that he had broken his back in two places. Cory underwent multiple surgeries and has just recently left the hospital to return to the family home. The doctors are optimistic about Cory’s recovery and he has already shown some improvement while working intensely with the physical therapists. The Mackay family has established a foundation in Cory’s honor to help offset the building medical costs and the necessary remodeling of the family’s home to accommodate Cory’s movement. If you’d like to make contributions on your own you may do so at any US Bank location and simply tell them you’d like to contribute to the “Cory Mackay Fund” or you may send donations to: Cory Mackay Fund, PO Box 814, Redmond, WA 98073-0814. Tony Berry, the current points leader and 2007 Inland Northwest Sprint Car Association (INSCA Champion picked up the win May 16th at the season opening event at Spokane County Raceway. 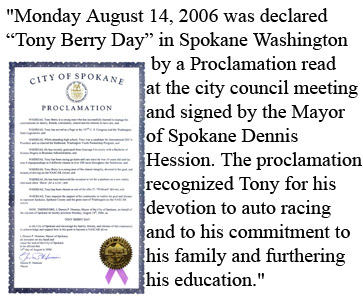 Spokane, WA (June 11, 2009) – Tony Berry and the B&B Motorsports team will head to the track again this weekend in search of their third win on the season in as many attempts; this Saturday at Spokane County Raceway in Airway Heights, WA. Berry, the current points leader and 2007 Inland Northwest Sprint Car Association (INSCA)Champion picked up the win May 16th at the season opening event at Spokane County Raceway. “We’ve had a tremendous start to the season and most of that success can be attributed to our new Lejeune Performance Chassis, the thing has been absolutely flawless so far and as a team we’re going to keep digging to maintain this pace,” commented the driver of the #53 sprinter. 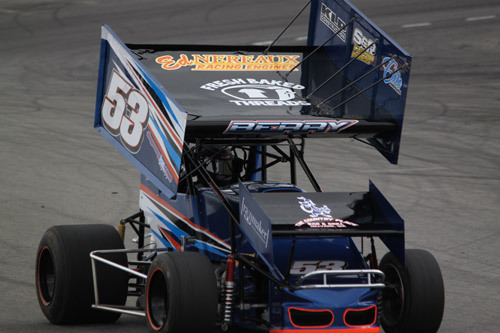 The #53 Mackay Spinal Injury Foundation, Ed Nereaux Racing Engines, Country Place, Sir Speedy Printing Spokane sprint car will be on display at the main NAPA Auto Parts store on Freya Ave. in Spokane Saturday June 20th for a Father’s Day Weekend extravaganza. “This is a great opportunity for us to expose our new car, the series and our great marketing partners to fans in an up close and personal way. Hopefully some new faces will come take a look at the car and be motivated to come to the next event. If you’re in the area please stop in and say ‘hi’,” said Berry. One of Berry’s long time marketing partners www.KodiakwebRacing.com has captured both in car and out of car video footage from the first two events of the 2009 season. While videography is only a portion of what Kodiakweb Racing has to offer, be sure to check out the site for video of the B&B Motorsports team. Also, the B&B Motorsports team is pleased to announce a new relationship with Silver Lining Limousine Service located in Marysville, WA. Berry had this to share, “We’re thrilled to announce a new relationship with Silver Lining Limos and proud to be associated with them. When we make our trips west of the mountains this year we will be traveling in style!” For more information on your ultimate choice for limo services in the Northwest visit www.SilverLiningLimo.com. Come out to Spokane County Raceway this Saturday night June 13th and cheer on the #53 as the B&B Motorsports team goes for win number three on the season. Qualifying will begin at 6 pm with racing at 7 pm. For more information on Tony Berry and the B&B Motorsports team or how to make contributions to the Mackay Spinal Injury Foundation visit www.AJBMotorsportsMarketing.com or call 800.336.2682. Having been behind the wheel of late models, go-karts, midgets and just about anything else that goes fast, Berry has settled into a nice situation with car owner Mike Bartle and the No. 53 MacKay Spinal Injury Foundation sprinter. Inland Northwest Sprint Car Association driver Tony Berry had not won a race in several years. That is, until he grabbed the checkers two weeks ago at Spokane County Raceway. The Gonzaga University graduate followed that up with his second win last weekend and leads the INSCA points standings heading to the third race of the season, June 13 at SCR. “It’s sure has been a long time in the making, but we’ll take it – that’s for sure,” Berry said. Berry does miss the door-to-door style of late model racing and would jump at the chance to get back into midget cars, but home may ultimately lie in INSCA. Berry is the INSCA points leader, but he has already conceded that a second championship will not be in the cards for this season. Making life and racing choices has always come with careful consideration to the bigger picture. From his start in a family-owned karting and late model team to Bartle’s ride, Berry has been driven by purpose. Through a friend of his fiancée, Leah Dotson, Berry has found a way to link racing and a civic endeavor during this season. Berry will donate half of his race winnings to the Cory MacKay Spinal Injury Foundation, a charity that aids the Washington State University football player’s recovery from injuries sustained in a May 7 automobile accident. “(The MacKay family’s life) has changed because of the accident and Cory not being able to move his legs right now,” Berry said. “All of that happened to them in the blink of an eye. They have so much to do, from remodeling their home to accommodate a man the size of Cory, who will be in a wheelchair for some time, to even finding a chair that fits him. Learn more about Tony Berry at www.kodiakwebracing.com and follow INSCA updates at www.insca.us. Spokane, WA (May 26, 2009) – The Inland Northwest Sprint Car Association brought their exciting version of pavement sprint car action to Stateline Speedway in Post Falls, Idaho on Saturday, May 23rd for the second race of the 2009 season. Enjoying one of the warmer days that spring time has offered so far this year, the INSCA group fielded a star studded nine-car field for qualifying. The first car to take to the track was the winner of the season opening event one week earlier, Tony Berry in the B&B Motorsports entry who ran a lap of 12.128 seconds around the quarter mile oval. This established the mark to beat as the rest of the field took to the greasy surface. Justin Popple in the ACI Coatings, Lube Tube, Spokane Pump #19 was the next car out and laid down a solid lap of 12.221 seconds. There were ultimately several challengers for the top spot, but Berry and Popple held on to the top two positions when it was all said and done. Lining up for the four car trophy dash, Dixon Helgeson had his HEI Motorsports, Lizard Chassis on the pole for the first time this season. Dixon missed the opening event of the 2009 season to attend the wedding of his son and long time INSCA member, Wes. Outside of row number one was the always formidable INC sponsored machine of Kevin Burck, followed by Popple and Berry . When the green flag waved Burck got the jump in the familiar gold number 65 and held on for an easy win, Berry was second, followed by Popple and Helgeson. In the heat race Ephrata Raceway Park regular Kurt Meyer lead the field to the green and held the top spot throughout the eight lap event. Followed by 2008 INSCA runner-up Cole Tupling, 2004 INSCA Champion Mark Jones, Helgeson, Popple, Burck, Kudrna and Berry . The main event lived up to its premier billing on the evening’s schedule as the INSCA series employs a full field invert within one second of fast time which had the fastest qualifiers start at the rear of the field. Kurt Meyer again brought the field to the green flag in the 25-lap feature event and jumped out to an early lead, followed by Jones and Tupling, but all eyes were on the Mackay Spinal Injury Foundation, Sir Speedy Printing Spokane, Country Place , Kodiakwebracing.com, Ed Nereaux Racing Engines #53 of Berry as he quickly began to dispatch with cars. Berry moved into third by the fourth circuit and stalked Jones for seven laps; finally making a move on the bottom entering turn one. Popple and Burck both waged their own war as they too moved towards the front. Berry got to the leader, Meyer’s back bumper on lap 14 and overtook the top spot with a pass on the outside coming out of turn two. Popple would get to third, but while battling an extremely loose racecar could not progress any further. The race was slowed twice for cautions featuring spins of Mark Jones and Dixon Helgeson. Ultimately it was Berry that would capture victory for the second time in as many weeks, second was Kurt Meyer after starting from the pole, Popple came home third, followed by Burck, Tupling, Helgeson, Donnie Kudrna, Jones and DNS Wesley Duren. The exciting, ground pounding action of the INSCA is scheduled to return to action June 13th at Spokane County Raceway in Airway Heights , WA . For more information on the Inland Northwest Sprint Car Association visit www.INSCA.us or call either 800.336.2682 or 509.499.9582. Spokane, WA (May 20, 2009) – Tony Berry and the B&B Motorsports team began the 2009 racing season with a bang Saturday May 16th at Spokane County Raceway in Airway Heights, WA – capturing the fast time award and cruising to the team’s first win and Berry’s third since 2005 with the Inland Northwest Sprint Car Association (INSCA). "I'll tell you what, racing is a game of preparation and circumstance and we have struggled in the luck department for several years. It was a trying time, but I have the best and most dedicated crew around and we all persevered for this one," commented Berry . That was especially true this past weekend when at the very end of practice as the team was attempting to scuff their qualifying tires Berry experienced injection problems. Co-owner Michael Bartle explained, "We were mystified what was causing the problem. We drew from well over 100 years of experience from individuals at the racetrack, consulted with our motor builder, Ed Nereaux and searched for what seemed like an hour for a problem. We were never able to come up with the cause and fortunately it didn't happen again." After not getting the opportunity to utilize the remainder of practice for a scuff session, the #53 Mackay Spinal Injury Foundation, Country Place, Whitley Fuel, Kodiakwebracing.com, Sir Speedy Printing Spokane, Ed Nereaux Racing Engines sprinter ran a fast lap of 16.48 seconds around the high banked half mile oval, averaging over 110 mph and good enough for quick time. After missing the trophy dash due to continued injection struggles, Berry lined up outside of row three for the feature event. Quickly moving into second place behind the Red Perkins owned #65-1 driven by Donnie Kudrna, the #53 stalked Kudrna for several laps before making the move on the outside of turns three and four. Once the pass was completed Berry checked out and easily cruised to his first victory of 2009. "That was perhaps the best car I've ever had. This was our debut race with our new Lejeune Performance Chassis and we couldn't be happier. The car was so consistently fast that we didn’t have to adjust the set up once all day long. It was a little freer than we had hoped for in the main, but since we weren't being pressured we were able to just cruise out front. What a great way to start the season for our team and marketing partners," said the ecstatic Berry . "Perhaps the coolest thing about this win is that we were able to do this for Cory Mackay and Mackay Spinal Injury Foundation. This is a trying time for him and his family and in our own little way; I hope this helps contribute to his recovery." Mackay, a student and football player at Washington State University was on his way home after finals recently and was involved in a single car accident; breaking his back in two places. The B&B Motorsports team will be contributing half of their 2009 winnings to Mackay Spinal Injury Foundation – "stay strong #6." Video from this event can be seen at one of Berry ’s longtime sponsors: www.kodiakwebracing.com with a featured in-car camera from qualifying. The #53 B&B Motorsports sprint car will take to the track again this coming Saturday, May 23rd at Stateline Speedway in Post Falls , ID. Come out and cheer on the team with qualifying beginning at 5 pm . 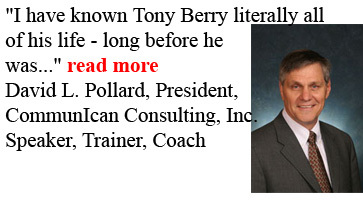 For more information on Tony Berry and the B&B Motorsports team call 800.336.2682 or visit www. AJBMotorsportsMarketing.com. 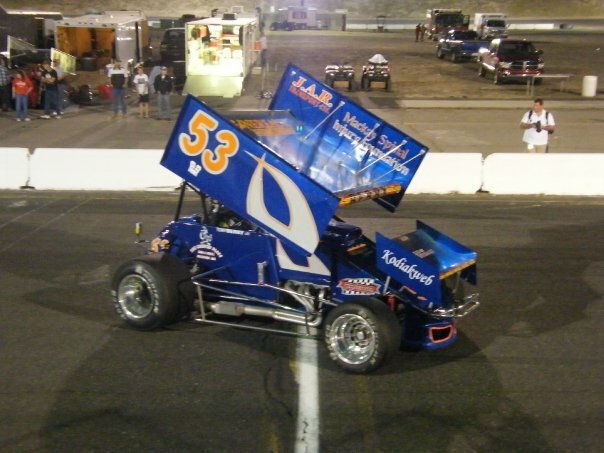 Spokane, WA (May 14, 2009) – Tony Berry and the B&B Motorsports team will once again head to the track this weekend with the intent of beginning their 2009 season. After enduring several rainouts, the official maiden voyage of their Lejeune Performance chassis will come this Saturday night at Spokane County Raceway in Spokane , WA . "This is perhaps the most prepared that we've ever been for a race season," shared Berry , the 2007 Inland Northwest Sprint Car Association Champion. "With all of the rainouts that we've had on race day, we've been able to get more practice days in than ever before. We've been very happy with how the car has responded at three very different racetracks and we're just hoping that we can put it through the paces in a race this weekend." The B&B team was able to test last weekend at the Spokane County Raceway facility and had great reviews, "The team that has been put into place at SCR ha s obviously taken on a huge task to get that facility race ready again, but from our perspective their efforts have been numerous and the place really looks good. They've spent a lot of time trying to make it safer and more user friendly and we're just thrilled to have SCR as an option to race at again in 2009," commented B&B co-owner Michael Bartle. Last weekend, the Lejeune Performance chassis, winner of the 2009 Spokane Auto Boat Speed Show racecar division, was on display at The Country Place a restaurant and bar located in Hillyard , WA and one of Berry' s longtime sponsors. "It was a great turnout at The CP for sure. The food was great, but the sheer number of cool hot rods, rat rods and racecars at one location was neat to see," said Berry . Racecar drivers and the men and women that work on them are clearly impassioned about their sport of choice, but every so often an event occurs that takes=2 0precedence over all else and puts your everyday activities into perspective. A freshman football player at Washingtson State University , Cory Mackay, recently was on his way home to Redmond , WA from Pullman upon completion of finals. While in transit, Mackay was involved in a single car accident near Washtucna after falling asleep just after 5 pm. 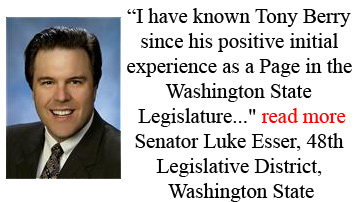 Mackay was air lifted to Harborview Medical Center in Seattle, WA where it was determined that he had broken his back. The Mackay family has established a foundation in Cory's honor to help offset the building medical costs and the necessary remodeling of the family's home to accommodate Cory’s movement. The B&B Motorsports team will be contributing half of their 2009 winnings to the Mackay Spinal Injury Foundation and additional donations can be made on behalf of Cory Mackay by sending to: Mackay Spinal Injury Foundation, PO Box 814; Redmond , WA 98073-0814 . Stay strong #6. Come out and cheer on the #53 Mackay Spinal Injury Foundation, Country Place , Sir Speedy Printing Spokane, Kodiakwebracing.com, Ed Nereaux Racing Engines, Lejeune Performance and Engineering, Longacre Racing Products, B&B sprinter at Spokane County Raceway under the lights this Saturday night, May 16th, 2009. For more information on the B&B Motorsports team and driver Tony Berry visit www.AJBMotorsportsMarketing.com or call 800.336.2682. 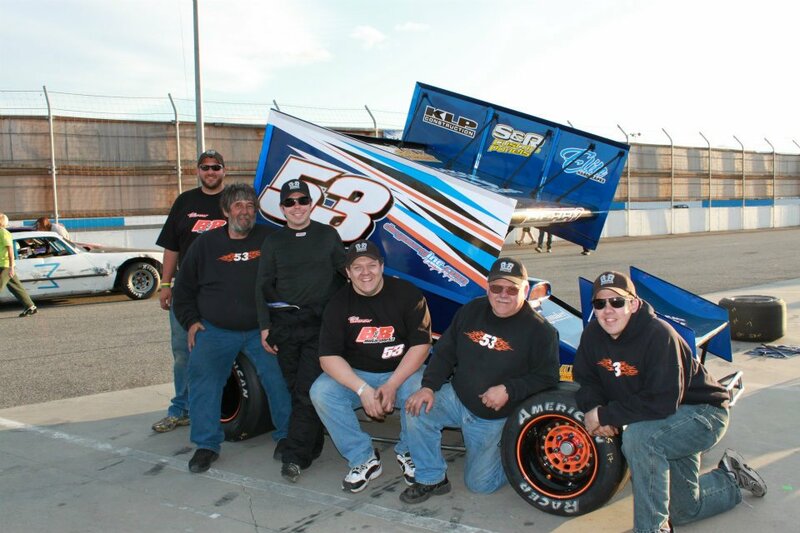 Spokane, WA (April 30) – The 2009 season for the B&B Motorsports team with driver Tony Berry will kick off Saturday night, May 2nd at the fourth annual Cast Iron Nationals sprint car event at Ephrata Raceway Park in Ephrata, WA. This premier event will bring competitors together from at least four different sprint car associations from around the Northwest and Canada to one of the most storied quarter mile ovals in the area. The event will also mark the debut of a new car for Berry and team in the form of a Lejeune Performance pavement car, but it will still don the familiar #53. "We are all very excited about putting this new car on the track," stated Berry. "The Lejeune name has performed at a very high level for a long time and we are very optimistic about what this year can bring." The 2007 Inland Northwest Sprint Car Association (INSCA) Champion, Berry, will again compete at select INSCA events in 2009 in their existing Michael Bartle owned car as well as running some ASA/NSRA events in the Lejeune with a potential foray into the WESCO series towards the end of the year. On the B&B 2009 schedule Berry had this to share, "The past several years we have run many different forms of cars: sprint cars, midgets and late models. As of right now it appears we will be focused on the sprinters for 2009, but I wouldn’t rule out potential races in other types of vehicles as the year progresses. Currently, our schedule for 2009 is highlighted by some special events and the desire to compete at some different tracks this year. We wanted to expose our sponsors, The Country Place, Kodiakwebracing.com, Sir Speedy Printing, Ed Nereaux Racing Engines, Moca Creations, Longacre Racing Products and ACRAnet to some different venues in 2009." 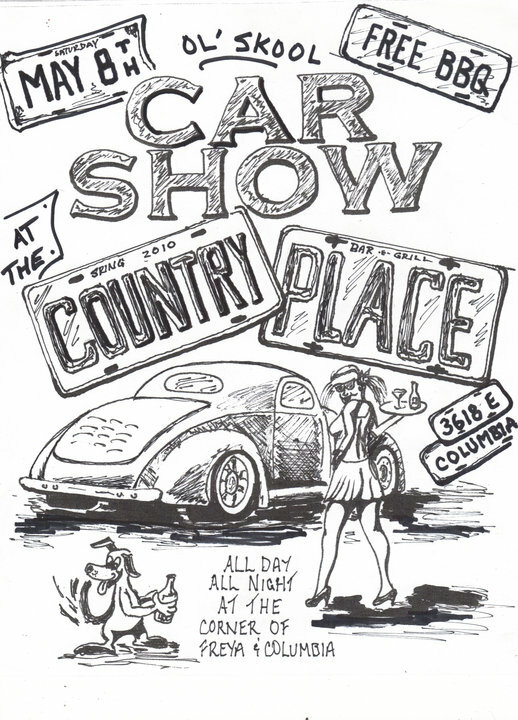 Perhaps the most exciting event on the 2009 schedule for Berry is the ASA/NSRA event planned for September 12th. The Rory Price Memorial event is on the 5/8th’s of a mile oval at Evergreen Speedway in Monroe, WA and is Berry’s 'home track' having grown up in Redmond, WA. "I've never driven a sprint car there, but I am really looking forward to it based on our experience at Spokane County Raceway’s half-mile. 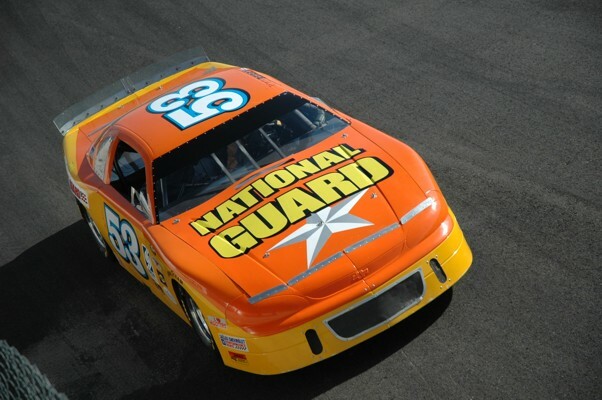 I have a lot of positive memories going to Monroe every weekend when I was younger to watch the NSRA cars and whole generation of late model and tour drivers – that will definitely be the highlight of the season for me," commented the 25-year old. The 2009 B&B Motorsports team consists of Crew Chief Loren Bartle, co-owner Michael Bartle, Kily Fleming and Bob and Jerry Records. Special thanks go out to the parents, siblings and wives that help support and put up with our sport of choice. Additional marketing opportunities remain for the 2009 season. For more information about Tony Berry and the B&B Motorsports team visit www.AJBmotorsportsmarketing.com or call 800.336.2682. Special thanks to Michael Baker of Kodiakweb Racing (www.kodiakwebracing.com) for providing the exciting INSCA Sprint Cars on-track video multiple displays." This is pretty unique - don't ask me how they do it. Place your mouse on the E below and drag to the U. "Berry to donate half of his racing winnings to the Cory MacKay Spinal Injury Foundation"
The 2006 season provided a great deal of excitement and opportunity for Tony Berry and the AJB racing team. The 22-year old Berry competed in three of the most competitive divisions in North West motor sports; Late Models, Sprint Cars and Midgets.